Our early morning trip to the Sabiah Gökçen Airport ( on the Asian side) was through thick fog that concealed the Bosphorus as we crossed the bridge. It is about 50km to the airport so we had a chance to see the vast expanse of housing in this area that extends much further than we went. There is a lot of high rise here, and generally newer buildings as this area has had more recent growth than the European side. It is hard to imagine how people can move around the city with such inadequate public transport and with the Bosphorus forming a major transport barrier. Our flight to Amsterdam took us over the Black Sea to the north, then we think over the Ukraine, Poland and Germany. We made it through customs and on to the Driebergen train with bike boxes and panniers with a minute to spare, and then didn’t have to change trains. This impressive record was then blotted by taking the wrong bus from Driebergen station -a faux pas soon corrected. It’s good to be back here with a few days to rest and recover before the trip home. Yesterday (Tues) we went to Den Haag to see the Queen and today we have visited Hoge Veluwe, one of The Netherlands’ National Parks. 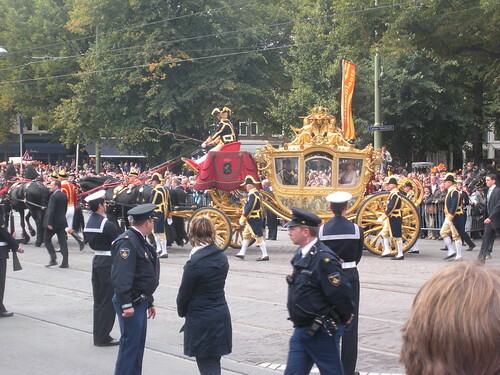 This entry was posted on 22 September 2010 at 5:52 pm and is filed under Netherlands. You can follow any responses to this entry through the RSS 2.0 feed. You can leave a response, or trackback from your own site.